I hope everyone had a wonderful Thanksgiving with family and friends. Over the course of the weekend, I’ve made two interesting food discoveries – about chestnuts and pumpkins. Josh’s parents have a great big chestnut tree in their front yard. This year, they managed to collect a few handfuls of chestnuts before the squirrels got to them. With the instructions on how to roast chestnuts in hand, freshly printed from a google search, the experiment began. While waiting for the chestnuts, I raved about the roasted chestnuts I used to eat in Hong Kong, freshly roasted in hot sand. They were delicious. When the chestnuts were finally ready, we all had a taste – the chestnuts were bitter and awful. Nothing like what I remembered. As it turns out, we had horse chestnuts, not the edible chestnuts. 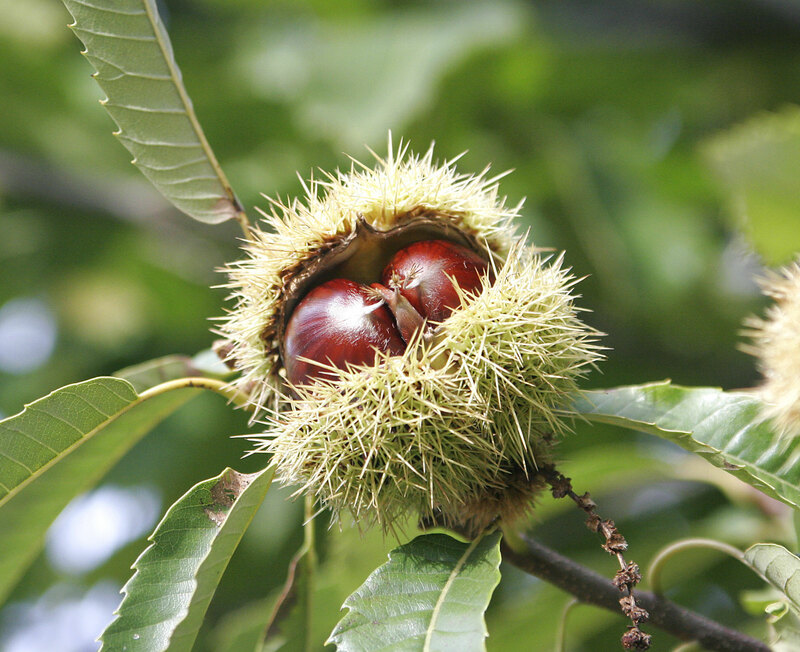 After a quick search on the internet, we learned that: horse chestnuts are slightly poisonous to humans, best left for the squirrels; the chestnuts with much spikier shells are the edible kind. As part of our CSA share last week, we got a pie pumpkin. I’ve never made pumpkin pie with fresh pumpkin before, so I looked it up on the internet. Did you know that canned pumpkin puree is not made from pumpkins? 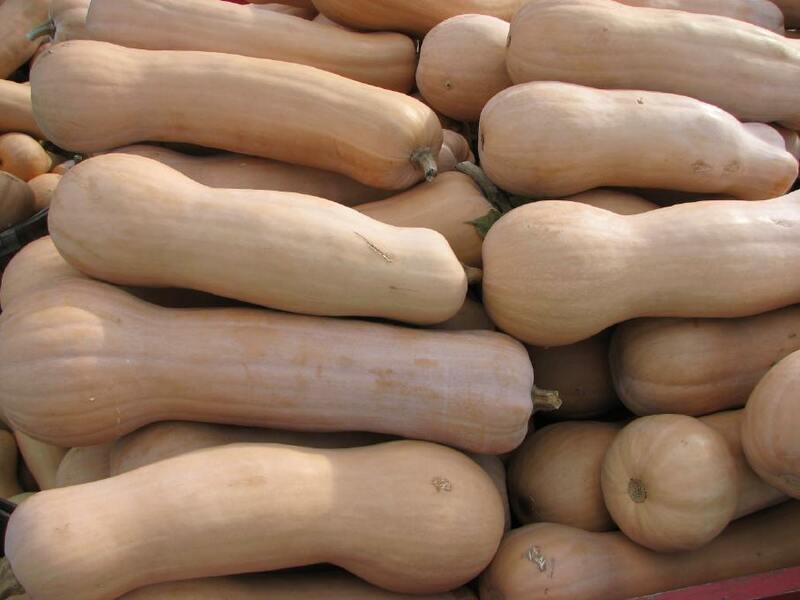 It’s Dickenson Field squash, a squash that’s cross pollinated with the butternut squash. It has tan colour skin and bright orange flesh. It tastes just like pumpkin to me, but then again, I’ve never tasted “real” pumpkin. 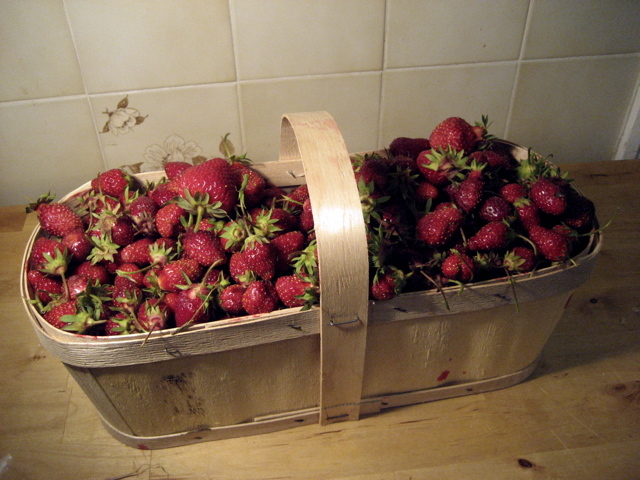 Having tasted the local strawberries from my CSA share, I was eager to get more. Lots more. 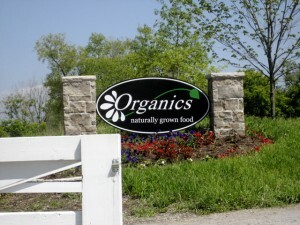 I searched the web for a local organic farm and found a small family organic farm not too far away. 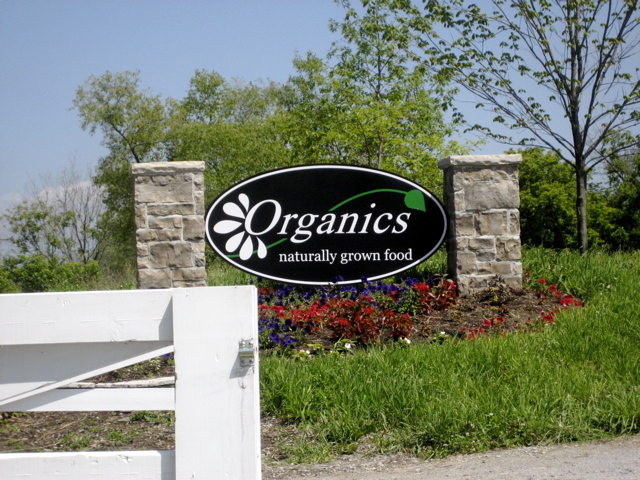 So on Sunday, Josh, Ella and I went for a drive and went to Organics Family Farm, a small local organic farm for some fresh strawberries. At the farm, there was a small farm stand with some ready-picked strawberries and organic strawberry and strawberry-rhubarb pies, freshly baked in the outdoor wood-fired oven. 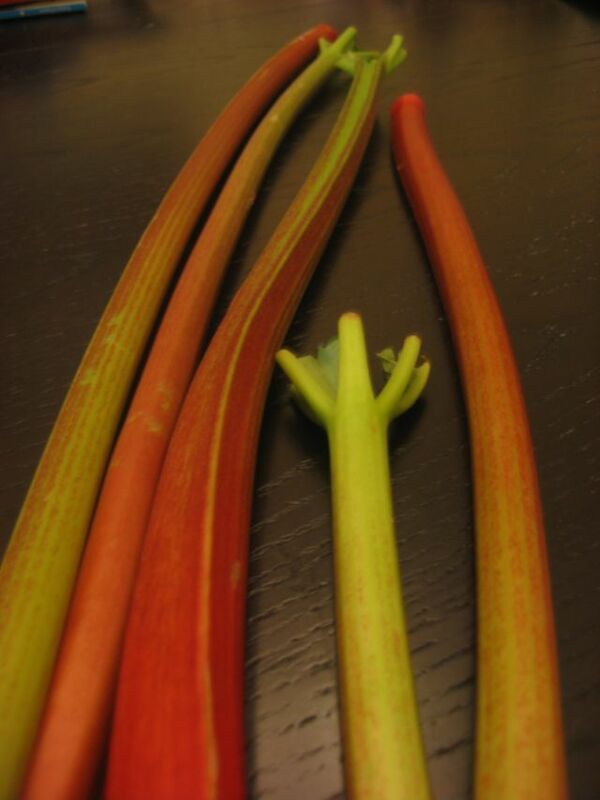 We promptly picked up a strawberry-rhubarb pie (there were only a few left and we were NOT leaving without a pie!) and a basket for some strawberry picking fun. They grow two varieties of strawberries: Veestar (a small and ugly but very sweet variety) and Honeoye (perfectly shaped but not as sweet). We filled our basket with strawberries (mostly the veestar) while we sampled the berries. They were so sweet and juicy, even better than the ones we got from our CSA share. Afterwards, we had a chance to talk to the owner/farmer. We learned that you can only grow strawberries on a piece of land for a maximum of two years before you have to rotate crops, and that the veestar variety of strawberry is losing its vigor and showing signs of being genetically drained. The plants are not as strong as they used to be and this is probably the last year they’ll grow them. That’s really too bad because they are the sweetest berries I’ve ever tasted. We ended up with 6(!) 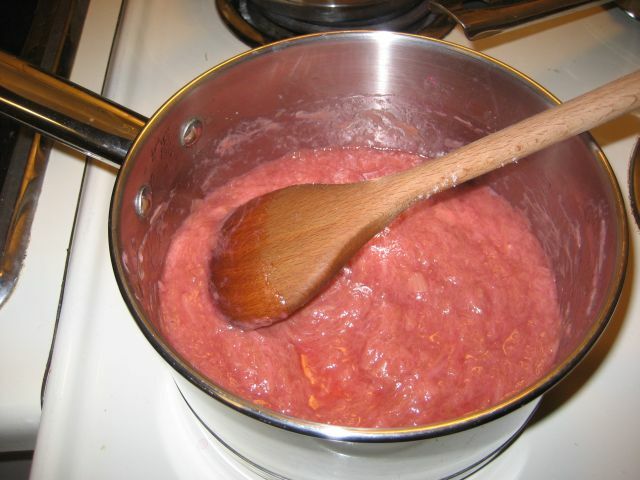 quarts of strawberries – way more berries that we know what to do with. 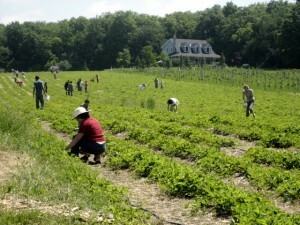 Perhaps we (I) were a bit overzealous in our berry-picking. We made strawberry loaf and muffins, strawberry smoothies and I think I’ll make some strawberry jam for the very first time. I’ve never made jam before – we’ll see how that goes. My kitchen smelled heavenly while this was baking. This bread tastes a lot better once it’s cooled. The recipe originally called for 1 1/2 cups of sugar, I thought that was a bit much and since the berries were so sweet, I reduced it to 1 cup and it was just sweet enough for us. Beat eggs and sugar; add oil and vanilla. Mix in flour, oats, cinnamon, soda, salt and baking powder. Add strawberries and mix well. Pour into two greased and floured 4 x 8 inch loaf pans. Bake at 350 degrees for 50 minutes. For muffins, bake for 15 minutes. I learned of Fresh From the Farm when I attended the Mom2Mom Holiday Show back in November. The timing was perfect since I was introducing my daughter to solid foods and have been looking for healthier alternatives for her. To be honest, I used to be a bit skeptical of organic foods. There wasn’t any official organic certification process and it seems that people label the food “organic” and charge you twice the price. Now that there are regulations in place and more information available, I’m all for organic food – when it’s affordable. Which brings me back to Fresh From the Farm. Fresh from the Farm is a small store that’s only open on Thursdays, Fridays and Saturdays. The owners Jacqui and Tim Schmucker bring in fresh meat from small farms in Mennonite communities near Kitchener-Waterloo every two weeks. All the animals are raised in humane conditions, drug-free and hormone-free. The prices are very affordable. The only catch is that you have to order in advance. Last week I put in my first order: 2 rib eye steaks, a whole chicken and some eggs. I picked up my order on Saturday and also bought a jar of Pinehedge yogurt. The steaks were at 1½ inched thick each and the chicken was huge. One steak was enough for both Josh and I for dinner. I just pan-fried the steak – flavourful, juicy and tender, even at “well done”. We had eggs for breakfast, roast chicken for supper, and yogurt for dessert. Everything was delicious. It felt good knowing that I was eating wholesome food.